Pip Wilson bhp: Homeless people - there is good work going on - I love this EXAMPLE - can we grow it? Homeless people - there is good work going on - I love this EXAMPLE - can we grow it? Every month since his election as mayor of Greater Manchester in 2017, Andy Burnham has been transferring £1,375 -15% of his salary - towards his manifesto pledge of eradicating rough sleeping in the region. The latest government statistics suggest Burnham is making progress, with Greater Manchester recording an 10% fall in street sleepers from 2017 to 2018, the first significant reduction since 2010. The annual homeless count found 241 people on the street one night in November, down from 268 a year earlier. Numbers of those sleeping rough have stabilised or fallen in eight out of 10 Greater Manchester boroughs. There has been particular success in Wigan, where the number has almost halved to 17. 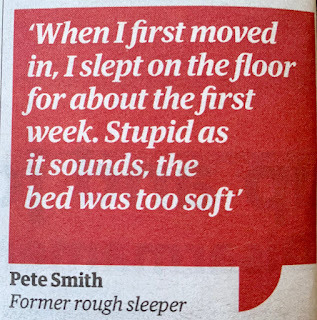 One of those was Pete Smith (not his real name), who moved into his own home last summer after six months living in a tent with his dog. A keen angler, Smith, 34, often pitched up by fishing ponds at nightfall, stashing his tent in a bush. Amphetamines, crack cocaine, cannabis and alcohol passed the time. If there was food, his dog ate first. Smith was eight stone by the time he accepted accommodation from the Brick, a charity for the homeless in Wigan. He is one of 246 rough sleepers helped into homes over the last 12 months under a payment by results pilot in Greater Manchester. It is funded via a "social impact bond", whereby investors receive a return dependent on results achieved. So far just two participants in the SIB are back on the street, according to Sarah Cooke, who runs the project. Many others have had wobbles. Smith included, but the SIB is designed to give people "not just a second chance”, but "third, fourth, fifth chances" when they struggle in their new homes. They do not have to overcome substance use before they are given a roof over their head. 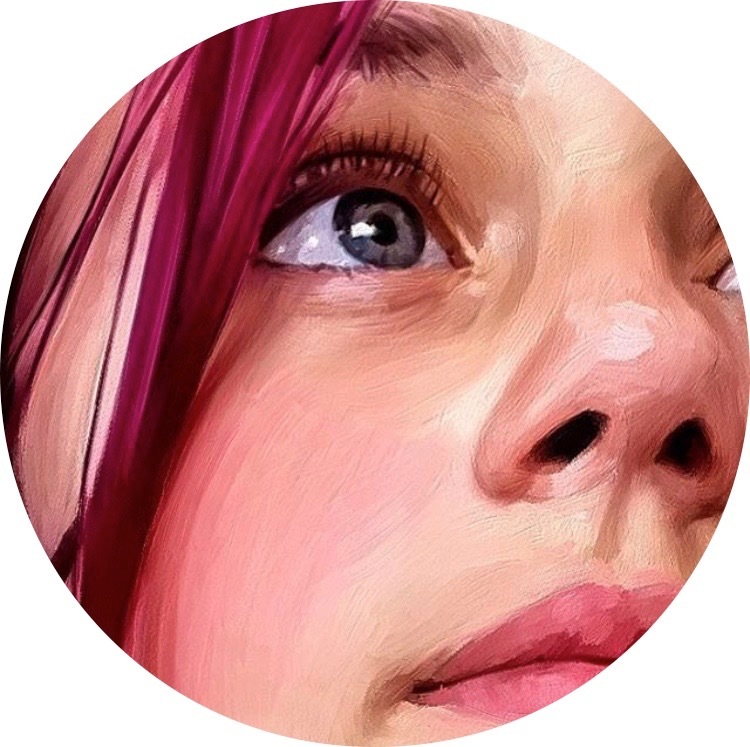 First they get the keys, then they are given intensive support to sustain a tenancy and tackle their problems, plus help to access education and training. 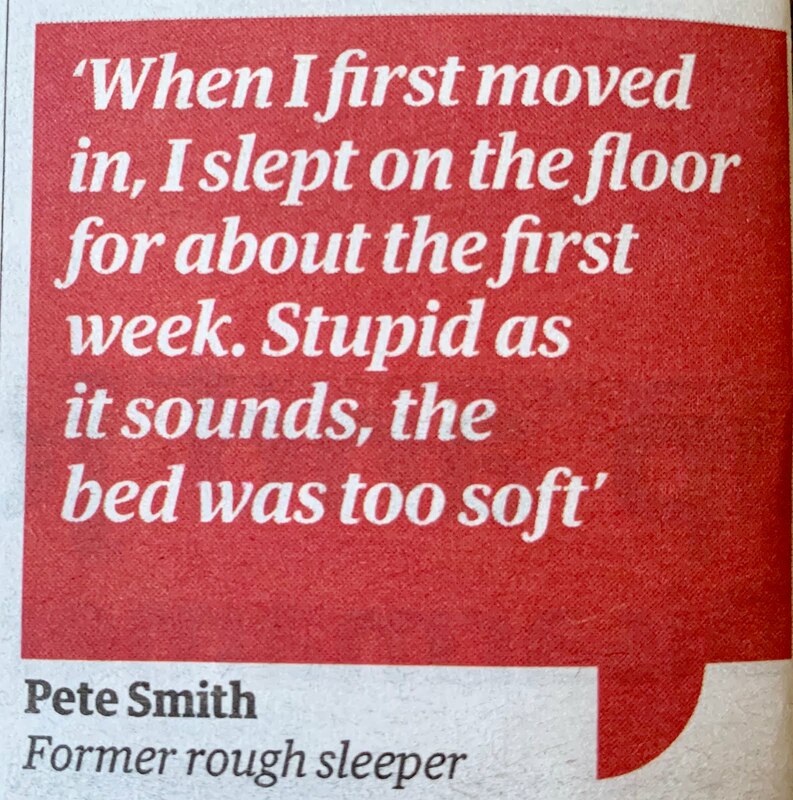 Smith, who grew up in care, had been homeless on and off since 2007. By the time he engaged with the SIB last summer he had been in prison three times. Jail was sometimes a ' welcome respite from life on the streets, he said. Accepting help from the Brick was daunting. I struggled at first because I was used to being on my own, just me and the dog. But he wanted to sort himself out, primarily because of his 14 year old daughter. It weren't great for her, with her friends. That's why I had to make some drastic changes in my life. It can't be nice going to school and people asking: is that your dad there, sleeping in that field?" First he moved into supported accommodation with five other men in similar circumstances. "When I first moved in, I slept on the floor for about the first week. Stupid as it sounds, the bed was too soft," Smith said. Part of his SIB deal was to go to the Brick's Wigan hub five days a week, where he learned skills including joinery and did courses in first aid and health and safety. In November he was deemed ready to have his own place: a social home in Leigh. He was given basic furniture and a "personalisation budget" to make it his own, plus vouchers for the supermarket. Recently Smith stopped engaging with his care workers, who have been working to get him back on track. But he started to stay off the streets, motivated by a speech his daughter gave at a recent family funeral. "She said: ''I hope you're all as proud dad as I am … … … ………………"